Our adventures in Northern India began after we rapidly abandoned a rain-swamped Delhi and took the quick flight hop to Leh, capital of the astounding Himalayan region of Ladakh. After several glorious weeks trekking, we took the overland route back down to Himachel Pradesh, and then west into the Punjab region. From there we returned to a slightly drier Delhi and then travelled east to Uttar Pradesh. The region is home to India’s Hindu spiritual capital Varanasi and the fascinating pilgrimage site for both Jainism and Buddhism called Sarnath, where Guatama Buddha began his teachings of the four noble truths from the now famous deer park. It's also a great place for sampling mouth-watering vegan food. It’s safe to say that we consumed a huge number of samosas during our travels in India. There is a propensity for snacking across the country, perhaps driven by the wonderfully varied and ubiquitous street food. The street food of India is never about expensive or unusual produce, but a celebration of the accessible and plentiful. Outside of the wealthier cities, this means much of the snacking is vegetarian or indeed vegan. But this makes no compromise on flavour, where even something based on only simple grains or a pulse, has heady heights of taste far beyond it’s basic components. It comes as no surprise that the origin of the samosa is likely to be Persian, as much of Northern India’s gastronomy reflects its early trading routes and deeply embedded Mughal history. The ubiquitous samosa has travelled as far as these ancient traders, since regional varieties are found across the Asian continent, and even north-east Africa. Traditionally filled with spiced minced meats such as lamb, beef or chicken, mixed with spices and green chilli, it is said that the origin of the vegetarian samosa was Uttar Pradesh. Given the location’s spiritual history in Hinduism, Buddhism & Jainism, all of which were centred around vegetarian and indeed vegan diets. In Jainism even the harming of a microscopic insect is avoided, as they gently dust where they walk and sit. We ate these crispy filled pockets of spiced potato and pea from numerous roadside vendors, sitting on the banks of the Ganges and whilst waiting for many a train (stations in India are always superb places to enjoy great street food). Sometimes we ate them straight from the paper, or ‘chaat’ style in a little bamboo bowl with some chickpeas and tangy chutneys. Indian food is truly one of my favourite cuisines, and its adaptability to British produce draws me back again and again as a cook. Lots of Indian recipes can be adapted to some of my favourite British produce and together with delicious Indian spicing, can only be a winner that will have your family coming back for more, time and again. Being a Northern lass, perhaps the appeal of samosas is their almost pie-like quality. British people love pies, especially Northerners. I don't think it's just weather related. More likely there's something rather great about a one handed snack, and even better when the gently spiced filling is perfectly balanced with not too crumbly pastry. 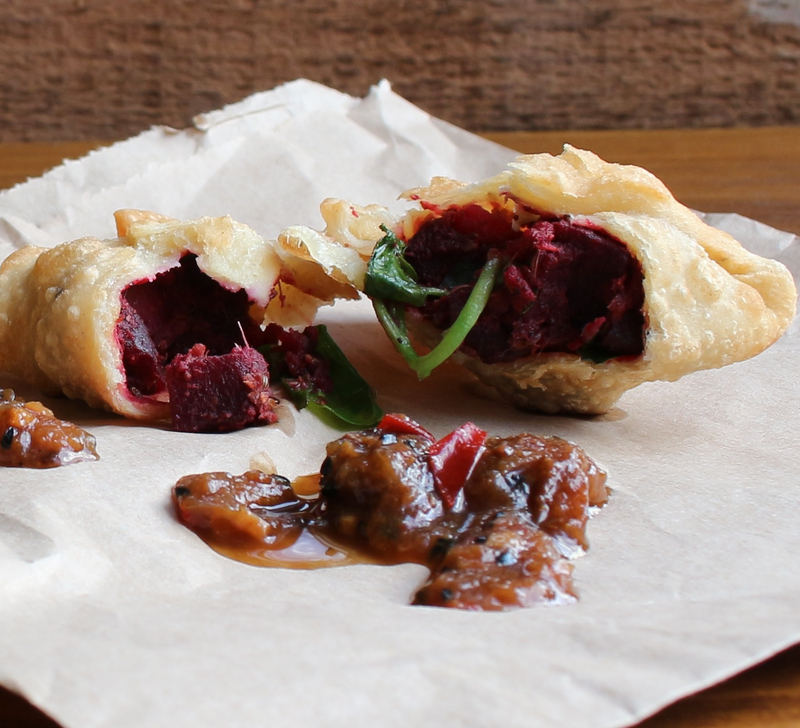 As an ode to the wonderful Indian samosa, here's my unique and delicious recipe for beetroot and watercress samosa, which I like to eat with a simple spicy pineapple and nigella seed chutney. It is the perfect combination of the plentiful (beetroot) and the exotic (pineapple). It sounds a little different, but I promise you the flavours will make your mouth sing. Or you could keep it all local (and at the moment seasonal) and serve them with a spiced pear chutney.